Over the decades much has been heard and spoken on tobacco and its ill effects time and again. Now let me put across my perspectives on this problem as a head and neck cancer surgeon. The question a lot of readers may wonder is - Why is this doc so concerned about tobacco issues? Well, a doctor may save more lives by indulging in tobacco control for several hours than by treating the diseases caused by tobacco for a lifetime! Tobacco use is not just a habit disorder: the International Classification of Diseases (ICD-10) has now notified 'tobacco dependence' as a disease. Tobacco is the only legally available consumer product in the world that kills even when used as per the manufacturer's specifications. No less than 4000 irritating, suffocating, dissolving, inflammable, toxic, poisonous, carcinogenic gases and substances and even radioactive compounds (nickel, polonium, plutonium, etc.) have been identified in tobacco smoke. Of these the World Health Organization has shown that at least 60 have been proven to be cancerous to humans. Nicotine is a powerful insecticide and poisonous for the nervous systems. It reaches the brain in smokers in just 7 seconds and blocks brain impulses. Indeed it has a great addiction potential. Moreover, studies have shown that in India, several tobacco products have metals detected which are more than the permissible limits. Although most of us are quite aware of the perils of tobacco consumption, today in India we have close to 300 million tobacco consumers. Every year more than 30-40 lakh people in India fall prey to diseases of the heart, lung or cancer owing to this deadly habit. India is presently having the largest number of oral cancers in the World. Is this number not large enough for us as citizens to wake up and ask ourselves and government to take necessary steps to curb this? The health care system in India is largely governed by the private sector (80%) which means a person who reaches out to embrace these habits, eventually ends up spending from his own pocket to treat the illnesses caused by this substance abuse. This further leads to increase in the financial burden to him and his family. Let’s stop here and look into what costs does the common man bear as a price of his addiction. Although tobacco affects every cell of the body, the 3 main illness caused by tobacco consumption are heart diseases, lung disorders and cancer. 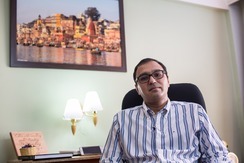 Rath and chaudhry way back in 1999 through an ICMR study showed that the average cost incurred to treat these disease were rupees 3,50,000, 29,000 and 23,300 respectively. This is a serious concern for the citizens of this country where 80% of our population resides in villages and 75% of our population has a PPP (purchase power parity) of less than 100Rs (2$) per day. How do we expect this common man to bear with the increasing costs of health care and why should he pay this price? Well the government says the economy needs tobacco! Revenue from taxation, exports and employment (agriculture, advertisement, vendors) are important for fiscal gains. The government on an average earns 9000 crores from taxes and exports on tobacco, but the expenditure on health diseases caused by tobacco is of the order of 30,000 crores (taking only 3 main diseases into consideration!). This comprises 1/4th of India’s expenditure on health. As a doctor, we often observe, that it is not only the patient who undergoes the treatment but also his entire family which bears the brunt both emotionally and financially. Furthermore, lots of these patients do not have accessible health care in the villages and hence need to move to town or cities with better facilities. Annually, India registers 1 lakh new cases of cancer and tobacco consumption is implicated in almost 50% of these cancers in general and 95% of head and neck cancers. Cancers of the head and neck include areas of the body such as mouth, throat, voice box or food pipe which take care of vital functions such as speech, swallowing, breathing and also maintain cosmesis. Hence cancer afflicting these areas kills the very life force of existence. As a cancer surgeon, dealing with these cases on a daily basis, involves surgically removing a patients jaw, tongue, throat or voice box, which may not be gratifying, more so when the thought crosses your mind that these cancers were caused voluntarily. The fact remains that these mutilating surgeries could have been avoided. We were always taught to practice a simple principle in medicine, “Treat the cause and not only the effect”. Thats right!! For instance, if any one of you is diagnosed with fever, would treatment with paracetamol only suffice? Naturally NO. Fever is the effect, the cause of which may be malaria, typhoid, dengue, H1N1 etc. Hence it is mandatory to treat the cause too. Similarly, treatment for these cancers, whatever is the modality; surgery, chemotherapy or radiotherapy, aim at treating the effect- CANCER after the cause has played its role. That is why the scientific world has moved from - trying to improve survival to improving quality of life for these patients. However, what could yield more gratifying results is “preventing cancers”. 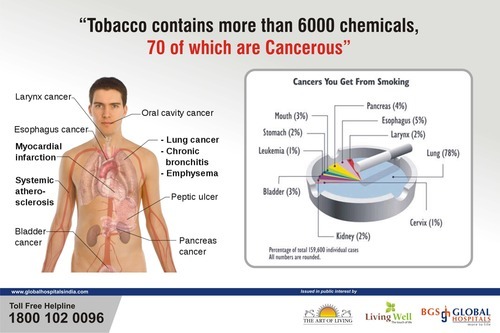 Similarly why not look at the lakhs of heart diseases, lung disorders or several such diseases caused by tobacco and develop the same preventive outlook. Rather than treat these diseases by medications, surgery or other treatments, let us say no to tobacco and embrace life! One of my patients a 30 year old gentleman, working in a software company was diagnosed with tongue cancer owing to tobacco consumption. The diagnosis of cancer came in as a shock to his family and his wife whom he was married to for a year. The patient was diagnosed at such an advance that despite chemotherapy and radiotherapy the tumour spread could not be controlled. Towards the end, the tumor has spread to the neck and started to show in his skin over the neck. All we could do was helplessly watch the young man go into the jaws of death. He bled to death in the hospital room on one fateful day. I still recall his words to me – Doctor, I got cancer because I consumed tobacco, but I quit the habit a year back after I was married. What wrong did I do to deserve this? He left behind him a devastated family and a young widow. This was the story of one of the million bread winners.